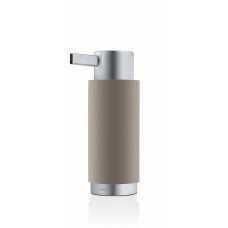 Simplicity is key to many of the designs produced by Blomus and the ARA Soap Dispenser is no different. Part of the larger ARA collection, the soap dispenser is a practical and understated piece for your bathroom that gives you extra functionality and removes the need for plastic bottles and packages to be left out on the sides, as your soap can be stored discreetly and functionally. Constructed from a combination of high quality stainless steel and artificial polystone, the ARA Soap Dispenser is a contrast of white and the matte stainless steel for the pump, head and base. The matte finish furthers the understated design and the bright white of the polystone is easy to coordinate with your bathroom suite or other accessories. Each soap dispenser measures 6cm in diameter with a height of 17cm and a depth of 7.5cm and it is easily filled with your favourite soap or other bathroom products. It coordinates perfectly with the other pieces in the ARA range, giving your bathroom a consistent and contemporary appearance. If you would like to find out more about Blomus and their wider collection please visit our dedicated brand page.